Every September, countries around the world participate in a global effort to rid the world's oceans of marine debris. In Okinawa, the Okinawa International Clean Beach Club (OICBC), a volunteer group founded in 1992 has spearheaded the local campaign called the Okinawa Cleanup Yuimaru, and this is your chance to get involved. 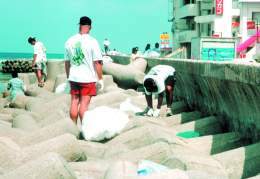 Coordinators for the Okinawa Cleanup Yuimaru 2001 are asking for support by either organizing your own beach cleanup or by volunteering on Sep. 15 and 16 at one of their scheduled locations. On Sep. 15, Okinawa Cleanup Yuimaru will take on a major project cleaning up the Sunabe Seawall area, both underwater and on shore. This event will take place from 10 a.m. to 4 p.m., and as this is a major undertaking, they could use as much help as they can get. The group will also clean up three other areas on Sep. 16 from 10 a.m. to noon. The first location is the coastline and roadside of Senaga Island, Tomishiro-son near the Naha Airport, the second the underwater and coastline of Cape Maeda in Onna-son, and the third the beachfront at Kyoda Beach in Nago. For more information on how you can participate in one of these cleanups, call the Okinawa International Clean Beach Club at 965-5371. Yuimaru is an Okinawan word meaning cooperation. 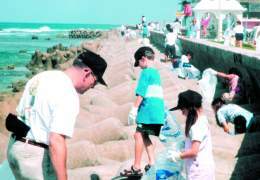 Okinawa Cleanup Yuimaru 2001 is your chance to cooperate with many people in an effort to help clean many areas in Okinawa. In the eight years of organizing this island-wide effort, the Okinawa International Clean Beach Club, together with over ten-thousand volunteers, has removed tons of debris from Okinawa's coasts and has saved countless numbers of fish and mammals from possible death caused by mistaking garbage for food and ingesting it. The project's main goals are to pick up trash along Okinawa's coastline, create awareness about marine pollution, educate on the importance of clean oceans and waterways, and help find solutions by collecting data during cleanups. The data collected from around the world is presented to the United Nations every year to help create international laws and treaties concerning marine pollution. It has played an important role in the passing of the Marine Pollution Act (MARPOL) and has been used to trace the actual sources of marine debris. The official date for the cleanup is Sep. 15 and 16, but any day in September is fine. If you would like to organize your own cleanup, choose a location that is not a public beach or one that is maintained by the city, gather volunteers by asking co-workers, friends, or by putting up flyers, try to form a committee to help you organize, pick up your data collection cards and become familiar with them, and make sure you bring everything needed for the day of the cleanup. Items you should bring include a first aid kit, drinks for volunteers, sun screen, a table for signing in, sign in sheets, a tent, pencils for writing on data cards, pens and markers, scissors, tape, paper, and trash bags. If possible, ask friends to donate these items. Trash bags must be the clear type and can be picked up from the OICBC if necessary. Trash must be separated in accordance with regulations set by the township where your beach is located, otherwise the city will not collect it. Usually glass is separated from cans and metal objects, and all other items are considered burnable. For more information on this matter, check with the City Hall or call the OICBC.